Winner of the Early Career Research Award 2018, which recognises outstanding research contributions made by researchers, up to five (active) years post PhD, awarded by the Executive Dean of the Faculty of EAIT on 28 November, 2018. 2016 Dean’s Award for outstanding higher degree by research theses, awarded by the Dean, the University of Queensland Graduate School on 28 July, 2017. CST University Publication Award 2016 is received from Computer Simulation Technology AG (CST) on 22 December, 2016 for "Portable wideband microwave imaging system for intracranial hemorrhage detection using improved back-projection algorithm with model of effective head permittivity. Sci Rep, 6:20459 (2016)". 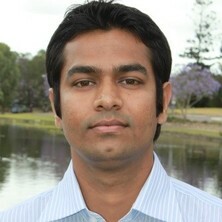 Travel award (AU$2k) is received for the presented paper titled "Performance comparison of directional and omnidirectional ultra-wideband antennas in near-field microwave head imaging systems" in the International Conference on Electromagnetics and Advanced Applications (ICEAA) 2016, held on 19-23 September at Cairns, Australia. Sentinels of Science Award 2016 for being one of the top 10% of researchers contributing to the peer review of the field of engineering, awarded by Publons on September, 2016. Canon Information Systems Research Australia Pty Ltd (CiSRA) Postgraduate Research Prize 2014 (AU$2k) is awarded on 03 July, 2015. First place in Space Publication awards 2010 (Hadiah Penerbitan ANGKASA 2010) in Category III: Professional Papers in the field of space technology for "A novel high gain dual band antenna for RFID reader applications. IEEE AWPL, 9: 653-656 (2010)". This was organized by National Space Agency (Agensi ANGKASA Negara), Malaysia and Ministry of Science, Technology & Innovation (MOSTI), Malaysia and presented on 15 October, 2011. 1 Gold and 1 Bronze medals are awarded in the Acceleration of Excellence of Knowledge Heritage Exhibition 2011, held on 3-5 May, 2011 at Universiti Kebangsaan Malaysia (National University of Malaysia), Bangi, Malaysia. 1 Gold and 1 Bronze medals are awarded in 10th Malaysia Technology Expo (MTE) 2011, held on 17-19 February, 2011 at Kuala Lumpur Convention Centre, Kuala Lumpur, Malaysia. 1 Bronze medal is awarded in 9th Malaysia Technology Expo (MTE) 2010, held on 4-6 February 2010 at Putra World Trade Centre, Kuala Lumpur, Malaysia. Mobashsher, Ahmed Toaha and Aldhaheri, Rabah W. (2014) CPW-Fed Folded Antenna with Forward-Directed Radiation Patterns for Handheld Dual-Band RFID Reader Applications. Microwave Journal, 57 2: 90-90, 92, 94, 96, 98. Mobashsher, Ahmed Toaha (2013) Investigation of a compact dual-band handheld RFID reader antenna. Informacije MIDEM, 43 1: 74-80. Azim, Rezaul, Islam, Mohammad Tariqul and Mobashsher, Ahmed Toah (2013) Ultra-wideband antenna with band-notches for lower and upper WLAN. Przeglad Elektrotechniczny, 89 1 A: 266-270. Azim, Rezaul, Islam, Mohammad Tariqul, Misran, Norbahiah, Mandeep, J. S. and Mobashsher, Ahmed Toaha (2012) UWB Antenna Adds Two Notches. Microwaves and RF, 51 12: 56-61. Mobashsher, Ahmed Toaha, Misran, Norbahiah and Islam, Mohammad Tariqul (2011) Ultra-compact wideband antenna for portable device applications. Informacije MIDEM, 41 3: 179-181. Azim, Rezaul, Islam, Mohammad Tariqul, Misran, Norbahiah and Mobashsher, Ahmed Toaha (2011) Compact UWB planar antenna for broadband applications. Informacije MIDEM, 41 1: 37-40. Mobashsher, Ahmed Toaha, Islam, Mohammad Tariqul and Misran, Norbahiah (2011) Design and development of compact microstrip antennas for portable device applications. Informacije MIDEM, 41 2: 105-113. Mobashsher, A. T., Islam, M. T. and Misran, N. (2011) Loaded annular ring slot microstrip antenna for wideband and multi-band operation. Microwave Journal, 54 9: 146-158. Mobashsher, Ahmed Toaha, Islam, Mohammad Tariqul and Misran, Norbahiah (2011) Wideband compact antenna with partially radiating coplanar ground plane. Applied Computational Electromagnetics Society Newsletter, 26 1: 73-81. Mobashsher, Ahmed T., Islam, Mohammad T and Misran, Norbahiah (2010) Recent developments of radio frequency identification tag antennas. Recent Patents on Electrical Engineering, 3 3: 160-176. Mobashsher, Ahmed Toaha, Bais, Badariah, Misran, Norbahiah and Islam, Mohammad Tariqul (2010) Compact wideband microstrip antenna for universal 5GHz wlan applications. Australian Journal of Basic and Applied Sciences, 4 8: 3411-3417. Mobashsher, Ahmed Toaha, Islam, Mohammad Tariqul and Misran, Norbahiah (2010) Design analysis of a dual frequency RFID reader antenna. International Review of Electrical Engineering, 5 4: 1838-1847. Mobashsher, A. T. and Abbosh, A. M. (2015). Developments of tomography and radar-based head imaging systems. In: 2015 International Symposium on Antennas and Propagation (ISAP). International Symposium on Antennas and Propagation (ISAP), Hobart, TAS, Australia, (). 9-12 November 2015.